I tweeted that this morning. And in between the RTs, were a couple of people asking me what I meant. So, here’s what I meant. I meant that you should stop listening to other people’s research and jump in the mud yourself. Social media is maturing. It’s maturing in the sense that people are more concerned than ever with obtaining ROI. And while I agree with Scott Stratten that there are PLENTY of other areas where we could use an ROI intervention, I understand that our clients are engaging in social media to increase their bottom line. It’s not about rainbows and faeries and unicorns for them; social media is about putting more money into their pocket. That’s why Outspoken Media creates social media strategies designed for that purpose. And when it’s not cost-effective for us to run your social media strategy, we’ll actually tell you that. As a small business ourselves, we’re not in the habit of wasting people’s money. We get ROI. Actually, we live by ROI. But chasing the ROI Unicorn is as dangerous as chasing the Engagement Unicorn as both result in tunnel vision and make you more susceptible to following false idols and bad advice. While the ROI Unicorn may not instruct you to “make friends” with your customers or to “be helpful”, he’s equally dangerous. There are many traces of ROI Unicorns on the Web. They’re the ilk that wants to focus on the most retweetable words, tell you what you should NEVER say to your audience (don’t talk about yourself, don’t be negatives, etc), offer guidelines on how to go viral/get famous and wants you to sleep cuddling the Unicorn’s analytics so you can check them when you wake up at 2am, 4am, and then again at 4:15am. The ROI Unicorn thinks social media follows a script that can be implemented by following the actions of strangers. They’re ONLY concerned with the money side of social. There’s a problem with this. The ROI Unicorn ignores what’s important to your audience. The ROI Unicorn only knows what his data tells him about Twitter users as a whole. That can be helpful in establishing some early best practices, but you can’t base a real strategy around it. For that, you need to do your own research. 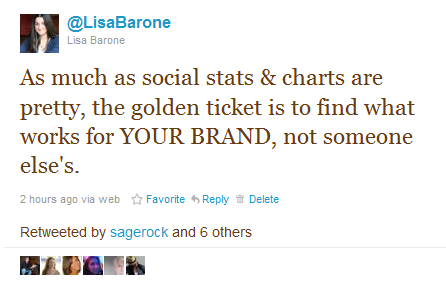 Because the stats and pretty charts are only helpful when they’re done based on the people you’re trying to reach. Otherwise, you’re simply squatting on other people’s information. That’s about as effective as using your father’s Amazon.com recommendations to pick out a birthday gift for your best friend. Hi. Bad intel. Wrong audience. My friend Tony Adam had a fantastic post yesterday urging people to listen to themselves, not other people. And he’s right. But to do that, it means you have to actually be doing the listening. You have to be getting dirty with your own audience. You need to have your hands in their habits, their interests and their interactions so that you’re able to understand what excites them and what works. Even if what works isn’t supposed to work because the ROI Unicorns told you it wouldn’t. The ROI Unicorns may be looking at great data types, but if the data isn’t about the people you’re trying to reach, where’s the use? The only stats that matter are your own. I recently had the opportunity to talk to Ed Abrams, Vice President of IBM Midmarket Business [look for my interview with him on SmallBizTrends next week], about how IBM uses social media and what he felt was most important for business owners to jump on. One thing he stressed was the importance of experimentation. To always be trying new things, to introduce new elements in your strategy and to take advantage of that real-time feedback. Because that’s how you’re going to find success, be it in social media, SEO or anything else. You learn by digging in and reacting to what you’re seeing. All generic data is going to earn you is generic failure because generic is the norm and most people fail. I’m more than aware that I “break” nearly all of the “what to do/what not do” rules that people list out as Best Practices and Must Follows. I see the lists, people email me the posts. But I break them because that’s what my audience wants from me and it’s why they follow me. I’m not doing it wrong. I’m doing it my way. And I’m doing it based off my calculations. My social media approach probably isn’t the one you should be using. You need to walk a different line and maybe not have so many emotional outbursts in public. But you won’t know that until you give a shot. You won’t know it until you dare to try and follow your instincts. Until you do your own damn research and stop blindly listening to everyone else’s. As Tony wrote, listen to yourself, no one else. I’ve commented before that we need to stop looking for the rules or believing data other people prepare. Because there are no rules and there is no perfect system. All there is a mud pit waiting for us to jump in. That’s where your answers are.